Calling all armchair Jeopardy champions! 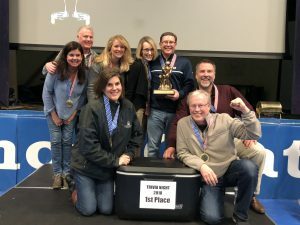 Bishop Chatard’s annual Trivia Night event gives trivia buffs of all skill levels the opportunity to show their stuff! Form a team, pick a theme, and get ready for a fun-filled night with friends, family and classmates. The event often sells out, so make your reservation early! It’s first come, first served. Come & Play! Be A Good Sport Trivia Night is hosted by the BCHS Athletics Booster Club and benefits BCHS Athletics. Your emcee for the evening is Pat Sullivan! Time: Checkin begins at 6:00 p.m. Trivia starts promptly at 6:45 p.m. Registration: Single Team Player: $30; Team of 8 Players: $240; Team of 10 Players: $300. Registration deadline is April 9. Jets Pizza: Order through our registration form and the pizza will be ready for you at BCHS. Pizza order deadline is Thursday, March 28. Beverages: Sun-King & Bier Brewery beer, wine and soft drinks are included in the ticket price. Absolutely no carry-in alcohol. ALL CONTAINERS/COOLERS WILL BE CONFISCATED AT THE DOOR. Other Food: Snacks and appetizers for your table can be carried in. A few sponsorship opportunities are available. Contact Amy Beausir at mollyandmyrtle@gmail.com for details. 2018 Trivia Night champions, led by team captain Pat Hurley. Members of the winning team include Pat, Lori Hurley, Paul Montgomery, Lisa Montgomery, Grantland Clapacs, Marla Smith, Erin Lockrem and Joseph Lockrem. 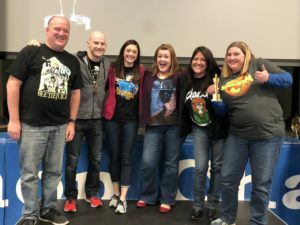 2018 Trivia Night runners-up, led by team captain Jennifer Wood-Thompson. Team members include Jennifer, Geoffrey Thompson, Caitlin Charles, Lucas Collis, Angela Lynn Hatem and Erin Buechler.